The last rose in my sunniest border is a sweet polyantha named 'Lovely Fairy'. Lovely Fairy is nearly unstoppable and practically "unkillable". If you want more, and I promise you will, she propagates easily. For me that means, a summer soft-wood cutting stuck into moist soil that will yield a new baby rose bush by the following spring. Here she is in November before the rains! If you like Rosa 'Lovely Fairy' you'll surely like the light pink flowered 'The Fairy'; white flowered 'Crystal Fairy'; and, the dark pink to red roses of 'Fairy Queen'. I don't know why more nurseries don't offer them instead of the newer 'landscape' roses. These roses have the souls of old roses. Gail Eichelberger is a gardener and therapist in Middle Tennessee. 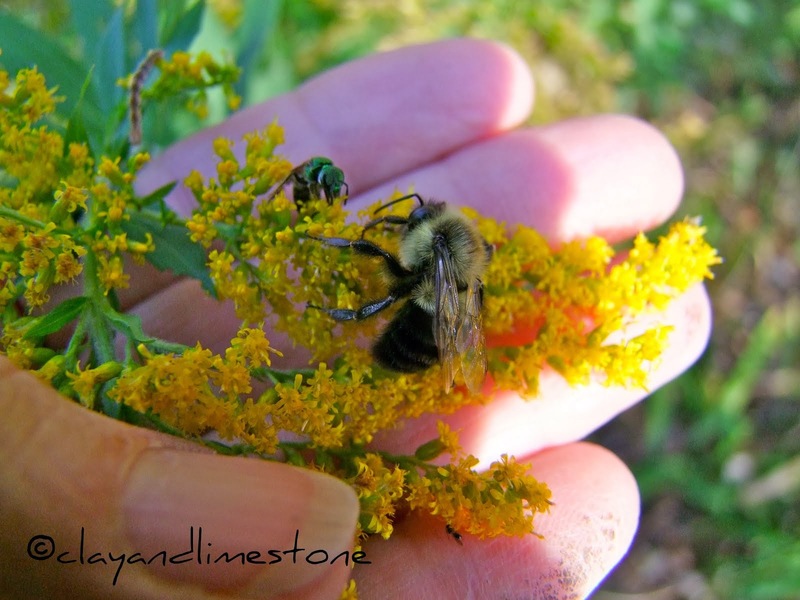 She loves wildflowers and native plants and thoroughly enjoys writing about the ones she grows at Clay and Limestone." 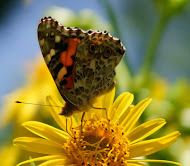 This post was written by Gail Eichelberger for her blog Clay and Limestone Copyright 2009-2011. This work is protected under the Digital Millennium Copyright Act. Please contact the author for permission to copy, reproduce, scrape, etc. Lovely Fairy is truly worthy of her name, dear Gail, as are the lovely images you have captured of her! I have Fairy Queen and can vouch for the non-stop blooming and easy care. I think I need Crystal, Lovely and the original, too. Wouldn't that be a smashing planting? 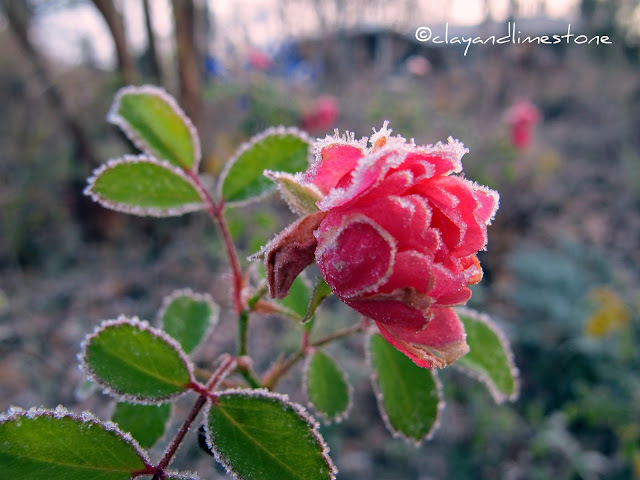 Love the photo of the frosty rose. Just beautiful!! What a lovely little rose, and such a trooper! She's most lovely! Any relative of The Fairy is a stellar rose for sure. I like the idea of a "fairy' rose. I have an old carpet rose that has a freeze dried bud on it. They are usually the last to give it up in my garden. Lovely roses, especially that second photo with the frost highlighted on the rose. I love the photo of 'Lovely Fairy' frozen in the first frost! Easy-care and strong survivors--this is the kind of rose for me. the souls of old roses - I like that - The Black Prince sends his greetings to the ladies! I totally agree with adding the right roses for your landscape. My Mom lives in clay in Va (7a), and struggles with roses too, though she's been able to keep thriving a Ballerina (amended hole). Just in case you ever get the wild hair. I'll pass on your success to her. I was excited when these new Fairies came out and stocked them for several years. They were not a big hit, so I had one of each planted in the display gardens at work where customers could see them. It still didn't help, and I am not sure why. We can't possibly have nothing but Knock Outs. It is sad seeing them go with the arrival of the frost. I posted my last rose photos and would you not know we had warm weather after that. The buds just may open, who knows? My ground cover roses look like your Fairies though. Not sure they will open. So lovely, Gail. As are we, this stunning rose is blessed to know the focus/love in your heart. It is sad to see them go but it is very pretty covered in the frost. Oh, how I adore the Fairy Rose too, Gail. 'Fairy' lines the walkway to my front door and has held a place somewhere in my gardens since 1991. Love that second frosty photo Gail! Good to know Fairy roses are so easy-care. I've always liked them, never tried them. It's a plus that they can do well in less-than-full-sun, and good to know they're so easy to propagate. I love playing around with propagating woody plants. The Lovely Fairy rose is indeed lovely! My favorite photo is her with her kiss of frost. I am sure it made her very uncomfortable, but to me it was just magical! I am glad she is so hardy! The frosted photo of your 'Fairy' rose is GORGEOUS Gail!! So lovely and I'm envious of your late blooms. Hope you had a nice Thanksgiving.